For decades, governments around the world have tried to cut emissions of carbon dioxide in the atmosphere so global warming stays below a 2 degree rise by the end of the century. That target is not likely to be met. But there is another kind of carbon – tiny soot particles given off by vehicles, cook stoves and crop fires called ‘black carbon’ – that contribute significantly to global warming which may be easier to control. 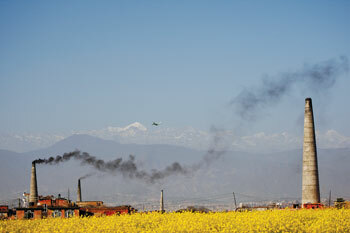 An international conference in Kathmandu last week organised by ICIMOD and the Climate and Clean Air Coalition (CCAC) discussed the best and fastest ways to reduce soot emissions. 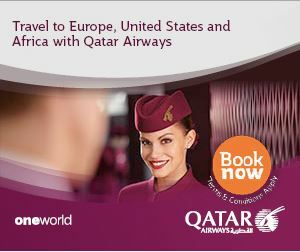 Recommendations will be presented at a summit of world leaders in Paris in December. Black carbon particles smaller than 2.5 microns, are emitted after incomplete combustion of diesel, coal, firewood, or crop residue, and are second only to carbon dioxide gas in warming the earth. 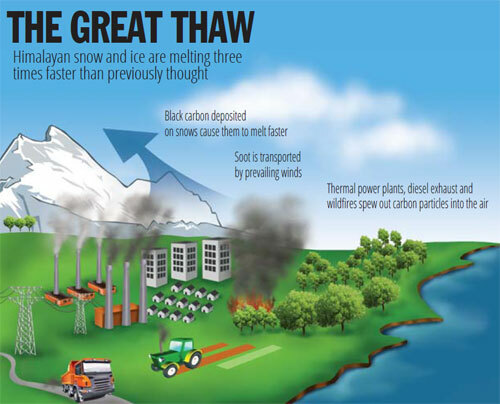 Himalayan glaciers also melt faster when this ash darkens snow and ice. Since global negotiations to cap carbon dioxide emissions are stuck, cleaning up vehicular exhausts, reducing smoke from domestic stoves, brick kilns and forest fires could reduce global warming by 0.5 degree by the end of the century, scientists say. Black carbon is classified as a ‘short-lived climate pollutant’ together with methane, aerosols, the refrigerant HFC, and surface ozone, which together add to the warming caused by carbon dioxide from fossil fuel-burning. Controlling black carbon would also have enormous health benefits. At present air pollution kills 2.5 million people every year around the world. In Nepal, indoor smoke from cook stoves are major causes of lung infections, especially among children and the elderly. Kathmandu Valley’s winter inversion that traps vehicle and brick kiln emissions makes it one of the most polluted cities in the world. For example, one survey in January on the outskirts of Kathmandu found that pollution levels doubled when brick kilns went into operation. Acute respiratory infection caused by indoor smoke is a major killer of children in rural Nepal. 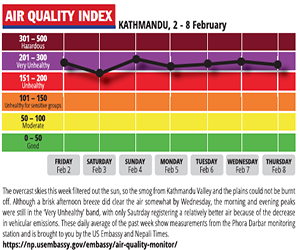 “Other cities have pollution emergencies, but in Kathmandu we regularly live through undeclared air quality emergencies,” says ICIMOD’s Arnico Panday, Senior Atmospheric Scientist at ICIMOD. Although the Nepal government has a target of making all homes indoor smoke-free by 2017, forest fires and the practice of burning agricultural residue will be harder to control. Even if Nepal reduces it, prevailing winds will still blow up pollution from crop fires in the Indian states of Haryana and Punjab. Farmers set fire to their fields after a harvest to quickly clear it for another crop, and there is a mistaken belief that ash is good fertiliser. However, crop fires can be outlawed. For example, the former Soviet Balkan republics don’t do it anymore, but fields are still set on fire after harvests in Russia. Soot from these fires are deposited in the Arctic, causing the ice there to melt faster.